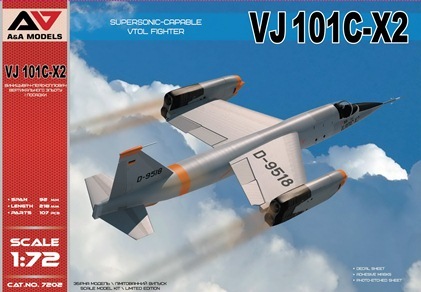 VJ101C-X2 SUPERSONIC-CAPABLE VTOL FIGHTER. 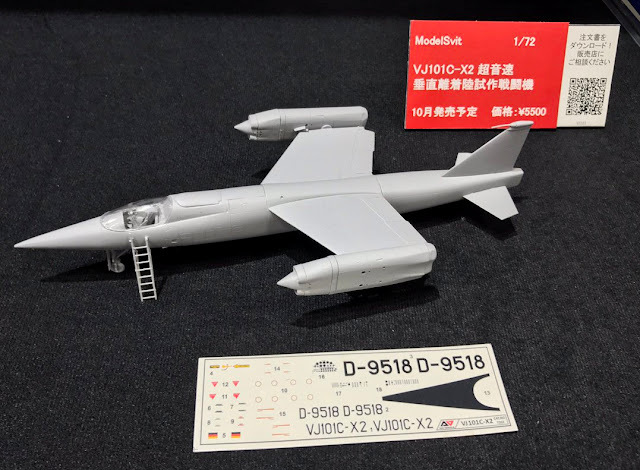 Brief history: In 1959 the design teams of the German companies Bolkow, Heinkel and Messerschmitt were formed into a consortium named Entwicklungsring Sud to develop a Mach 2 VTOL interceptor for the Federal German defence ministry. Heinkel left the consortium in 1964 and in the following year it was re-formed as a company with the title Entwicklungsring Sud GmbH, known more usually as EWR.Two prototypes of the EWR VJ 101C single-seat experimental VTOL aircraft were built. Generally similar, they were both of high-wing monoplane configuration, primarily of light alloy construction, had retractable tricycle landing gear and accommodated the pilot in a pressurised cockpit, seated on a Martin-Baker ejection seat. Powerplant comprised six RB.145 turbojets, developed jointly by Rolls-Royce and MAN-Turbomotoren, with two mounted vertically in the fuselage, immediately aft of the cockpit, and two in a swivelling pod at each wingtip. ​The VJ101C X-2 (second prototype) had ​afterburning engines in the wingtip pods, providing greater power for take-off and landing, and this made its first hovering flight on 12 June 1965. Four months later, on 22 October, the X-2 achieved the first full transitions from vertical to horizontal flight and vice versa, but development was discontinued soon after.